Detox water is the latest health and wellness fad, with celebrities and online influencers extolling its many virtues. Although it probably won’t help you lose weight, detox water does offer the indirect benefit of keeping you hydrated. Other alleged health benefits of detox water include boosting the digestive system and fighting free radicals. Detox water is water that has been infused by certain fruits, vegetables, or herbs including lemon, apple, cucumber, mint, basil and more. Detox water evangelists claim that certain ingredients, mixed with water, will help flush the system of harmful toxins that weigh you down. But essentially, detox water is just infused water. The thinking goes like this: every day, you consume environmental pollutants and various potentially toxic substances that can affect your behavior, metabolism, and immune system. In theory, detoxes provide fat-burning benefits by speeding up your metabolism. Proponents also claim that detoxing helps address inflammation, bloating, and issues with the digestive tract. Most detoxes require you to fast or seriously limit your diet. For example, when you embark on a juice cleanse, you’re expected to consume only fresh fruit juices and water for a period of three to seven days. Detox water is often touted as a way to complement a more intensive dietary cleanse or detox, although many people instead use it as a way to kickstart the metabolism without committing to any serious dietary changes. Detoxing in and of itself is one of the most controversial health trends of the decade. There are an endless number of premade detoxing products on the market — from the super-popular Master Cleanse to supplements that flush bacteria from the system — many of which are costly and restrictive. Detox water will provide you with health benefits but very different than the outrageous ‘cure-all’ claims advocates promise. Most of the health benefits come from the value that keeping hydrated has on the body. Premade detox water is ideal for a grab and go lifestyle, but many prefer to make their own detox water at-home. These custom blends can provide the flavor and benefits that best suit your individual needs. Each recipe starts with selecting the fruits and vegetables that target your needs. Cucumbers and watermelon are two of the most popular options as both provide a delicious flair as well as serious health benefits. Cucumber is a vitamin rich option with anti- inflammatory properties, while watermelon soothes sore muscles and may even lower blood pressure. Strawberry, Mint and lemon are other common infusion options, while the more adventurous can try ingredients like cayenne pepper, ginger, or cinnamon. After selecting the ingredients, drop the produce into an infuser bottle or infuser pitcher. Fill the container halfway to the top with ice, and fill any remaining space with water. After an hour in the fridge, your detox water is ready to drink. Detox water eliminates toxins — One of the common beliefs held by those who embark on any detox program — whether that be an apple cinnamon detox or a juice cleanse — is that it gets rid of toxin buildup in the body. Unfortunately, there’s little evidence to support those claims. That’s simply because the body is already equipped with its own detoxifying tools, primarily the kidneys, liver and skin. There is no proven way to make these systems work better or detoxify more. It busts fat — You’ve seen the claims: drink some tasty watermelon detox water in place of plain water and watch the fat melt away. Sadly, it’s just not that simple. Detoxes are considered “crash diets” because they deprive the body of certain food groups. They might provide temporary weight loss, but they don’t offer a long-term solution. In fact, some actually cause rapid weight gain when the detox is over. The healthiest and most effective way to lose weight is to diet and exercise. It’s totally safe — While adding infused water to your diet can definitely boost your health by helping to keep you hydrated, drinking it alone or with a highly restricted diet is generally not good for your health. When you starve the body of essential proteins, fats and amino acids, you may experience dehydration and digestive issues. Serial detoxers may experience more serious metabolic issues, such as an excessive amount of acidity in the blood, which can cause major complications like coma and even death. It boosts your overall health — The fact of the matter is, you simply won’t get the same benefits of certain superfoods when you drink them compared to when you eat them in their whole form. Certain water detoxes also claim to adjust the body’s pH levels, which could help fight certain diseases. However, experts agree that there is no way to adjust the body’s pH level through food or drink. It improves organ function — Some claim that detox water (and detoxes in general) have the power to rejuvenate the liver. Milk thistle is one of the most popular concoctions for this purpose. Sadly, there’s no evidence to back up these claims. It provides nutritional benefits — We’ve already covered how eating your nutrients is more effective than drinking them. But eating whole foods also helps you to stay fuller for longer, which prevents you from binging or indulging in particularly hefty meals. Infused water only contains small traces of nutrients (compared with say, juicing, which provides plenty) so it won’t provide many benefits for those looking to boost the body via vitamins and minerals. Okay, now that we know detox water is unlikely to help you burn fat, let’s take a look at some of the known benefits. Many detox water recipes call for ingredients that are good for your overall health, but the truth is that it’s the water itself that’ll help you lose weight and feel better. It’ll keep you hydrated — If there’s one measurable benefit of adding detox water to your diet, it’s that it’s more likely to keep you hydrated than plain water. That’s simply because your water tastes good, so you’re more likely to get your recommended daily amount. If you’re looking for a great way to trick yourself into drinking more H2O, it’s a good option. There are no known risks — Adding detox water to your regular, healthy diet (not as a substitute for food altogether) is a risk-free way to help boost your day-to-day health. Sipping on cucumber water, fruit water, or sassy water is unlikely to cause any serious issues over time. Detoxing only becomes dangerous when it’s used as an alternative to food on a crash diet. It’s not all bad in the weight loss department — Detox water is no better than regular tap water, but water itself is a good tool to use when you’re trying to lose weight. Studies show that drinking water increases the number of calories you burn, reduces the appetite and prevents weight gain. But there is no evidence to suggest that infusing your spring water with fresh mint, ginger, apple cider vinegar or any other ingredient will speed things up. Detox water can have several health benefits, however it does have its limitations. Some claim that detox water can clear up your skin or balance your pH, however there is little proof to back up these claims. When looking at detox water, it is important to have realistic expectations of its benefits and result. At the end of the day, whipping up some detox water on occasion isn’t going to harm you over the long-run. Indeed, for the simple fact that more water equals better health, you may feel better when you add it to your routine. Just be wary of the miracle claims touted by detox fans, and remember that these drinks are unlikely to rid your body of toxins or melt away fat. In short, it’s the water that’s the miracle drink, not the added infusions. Whether pre-bottled or made at-home, detox water has a whole host of benefits. Some of the following options have been specifically designed to provide a detox experience, while others will allow you to make your own detox water at-home for years to come. Their name says it all, Detox Water is among the most popular detox options available. Combining aloe with electrolytes and a dose of vitamins, this water can improve digestive health, skin elasticity, and even your immune system. With six flavors, Detox Water offers a perfect blend for everyone. Crisp’s Aloe Glow is health water at its simplest. Organic aloe provides a natural source of vitamins, enzymes, and antioxidants for your daily health needs. 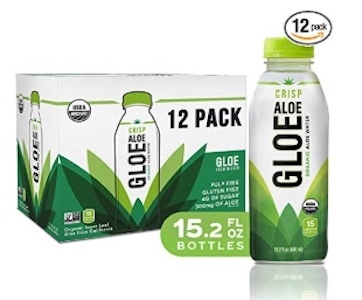 Aloe Glow comes in a variety of sizes and flavors to best fit your lifestyle. 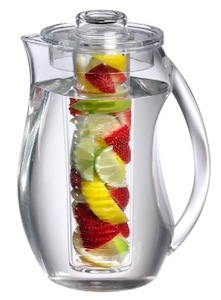 Prodyne’s fruit Infusion pitcher is ideal for those looking to make their own detox water. The pitcher’s clear acrylic design allows the natural colors of your fruit to shine through for an added beauty at your dinner table. The 93 once pitcher elegantly separates the infusion ingredients from your water for a simple detox experience. 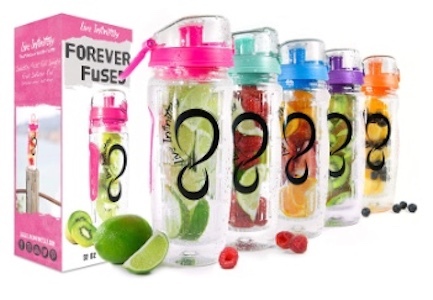 Available in a variety of colors, Live Infinitely Infuser Water Bottles allow for homemade detox water on the go. Whether you’re on your way to the gym or the office, this water infuser offers beautiful clear design that shows off your healthy lifestyle. If you are new to detox water or are looking for a fresh recipe, Forever Fuse includes a list of interesting infusion options.